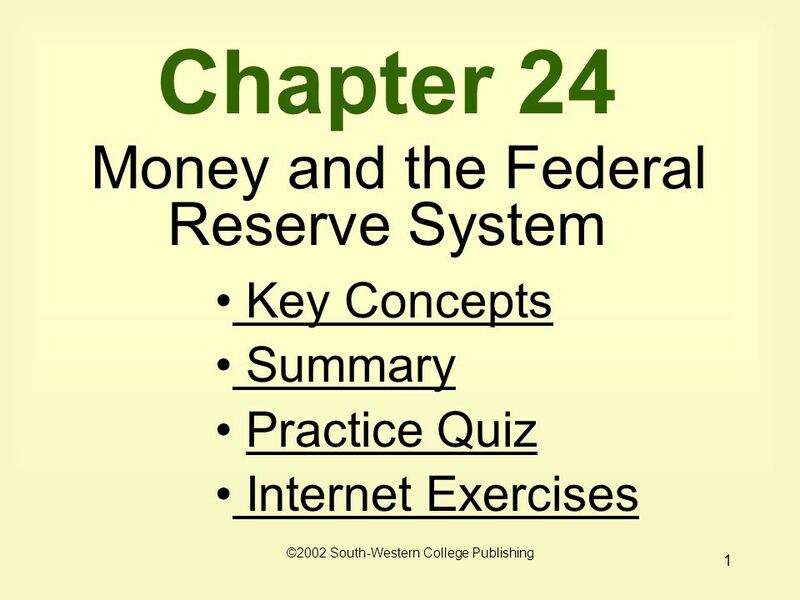 1 Chapter 24 Money and the Federal Reserve System Key Concepts Key Concepts Summary Summary Practice Quiz Internet Exercises Internet Exercises ©2002 South-Western. 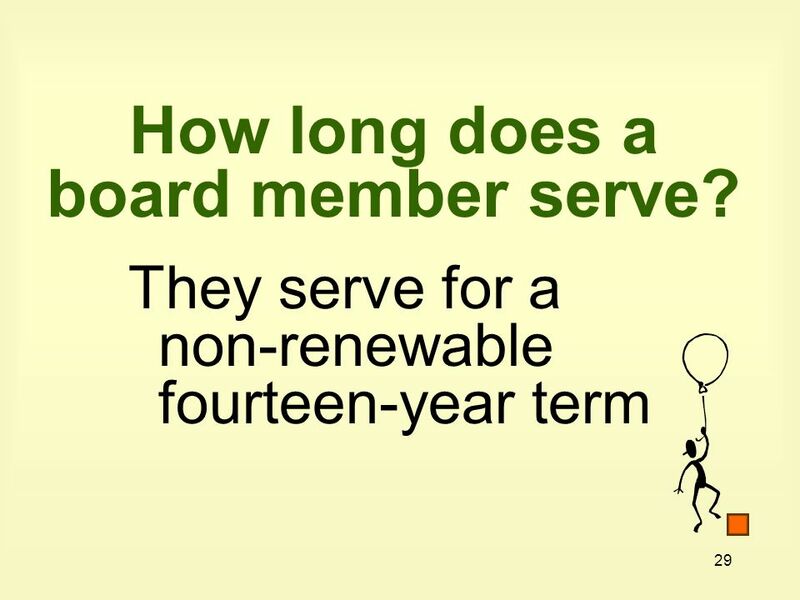 30 30 What is the responsibility of the board? 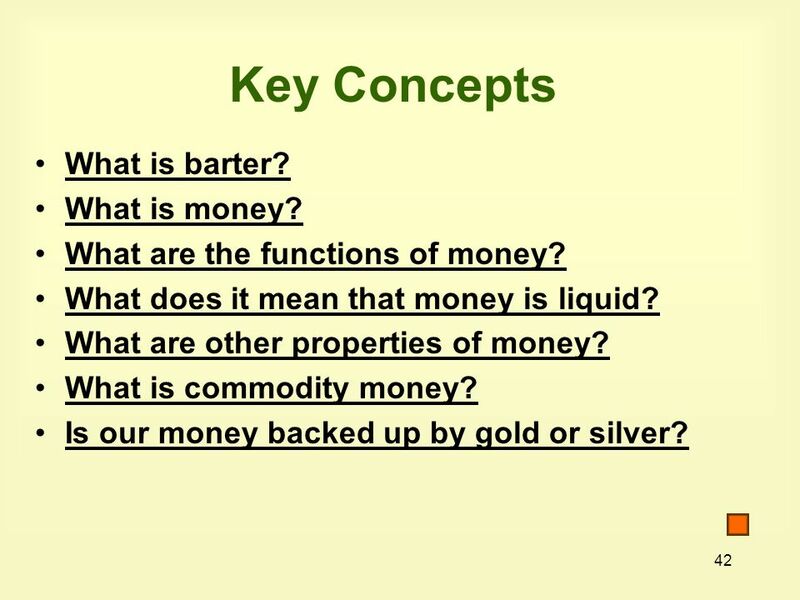 To supervise and control the money supply and the banking system of the U.S.
42 42 Key Concepts What is barter? What is money? 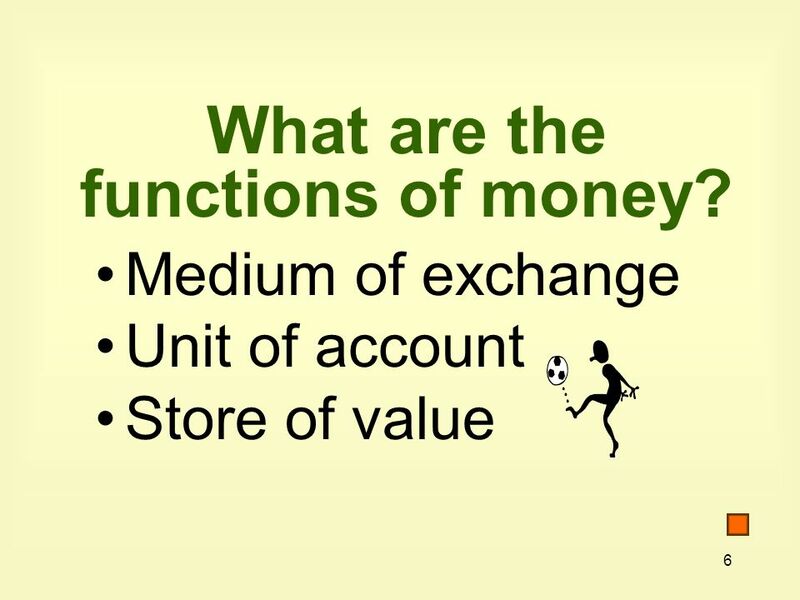 What are the functions of money? 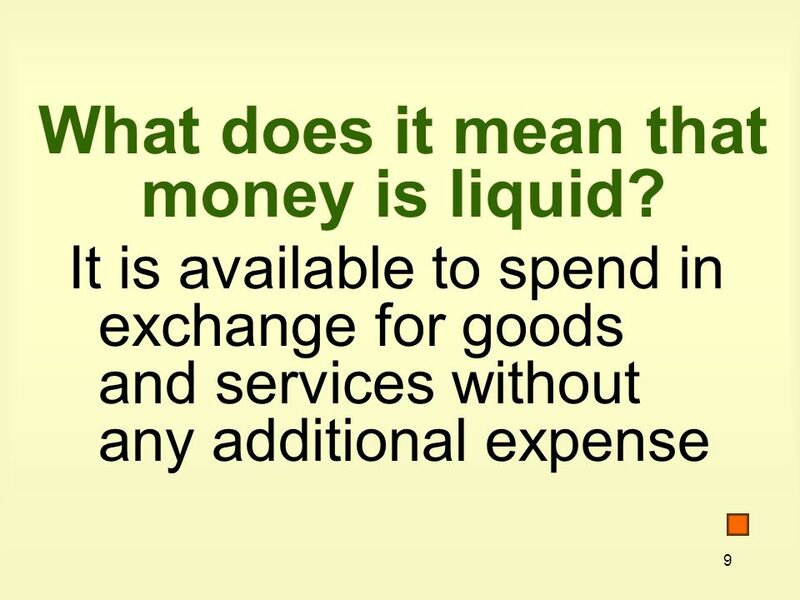 What does it mean that money is liquid? 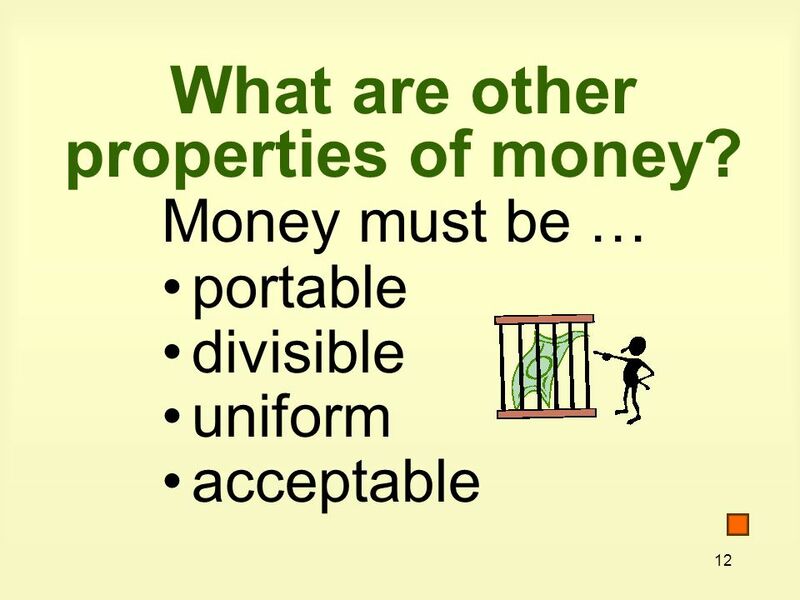 What are other properties of money? 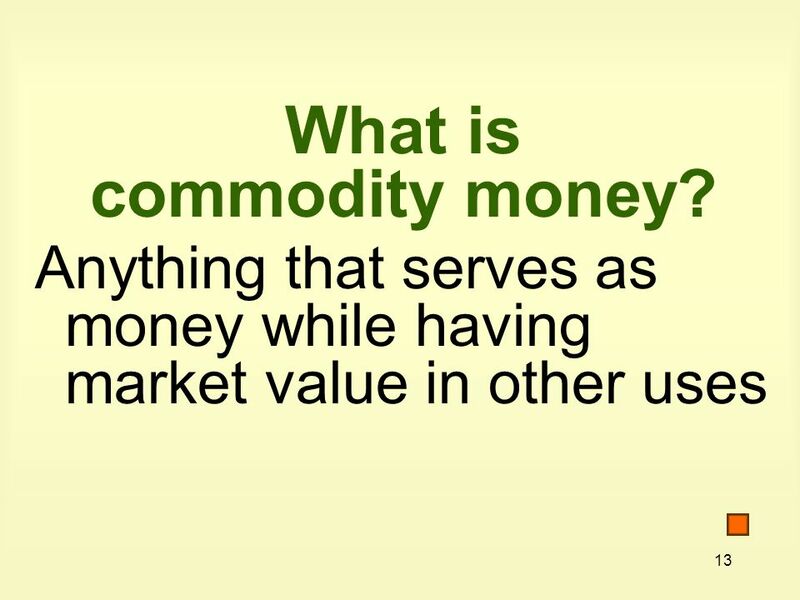 What is commodity money? Is our money backed up by gold or silver? 43 43 Key Concepts cont. 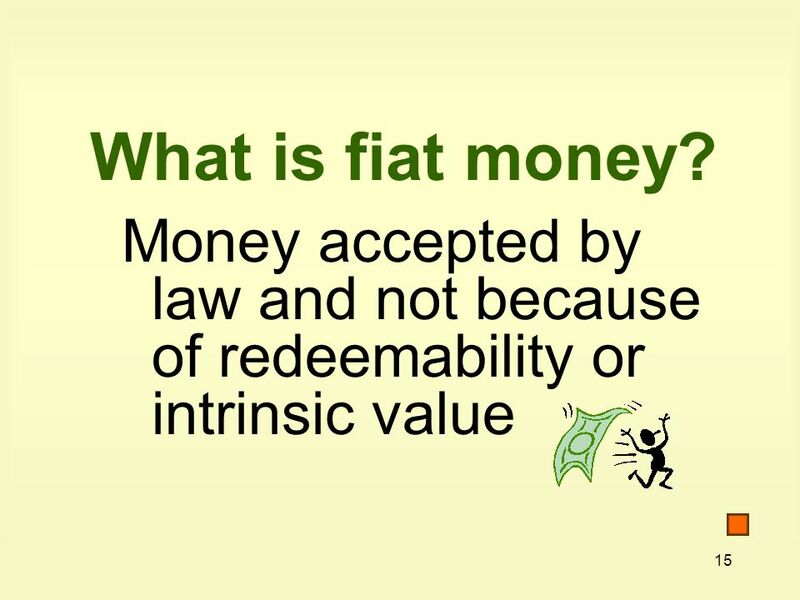 What is fiat money? 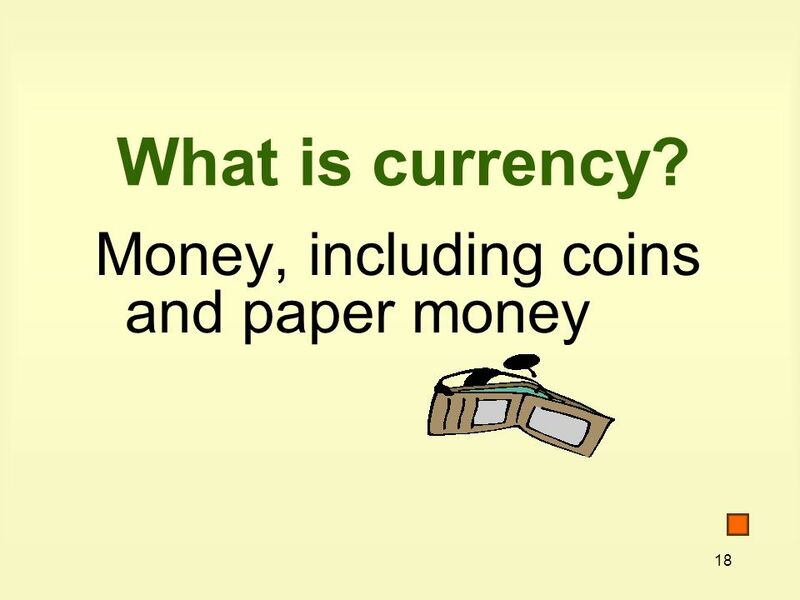 What is currency? What is M1? 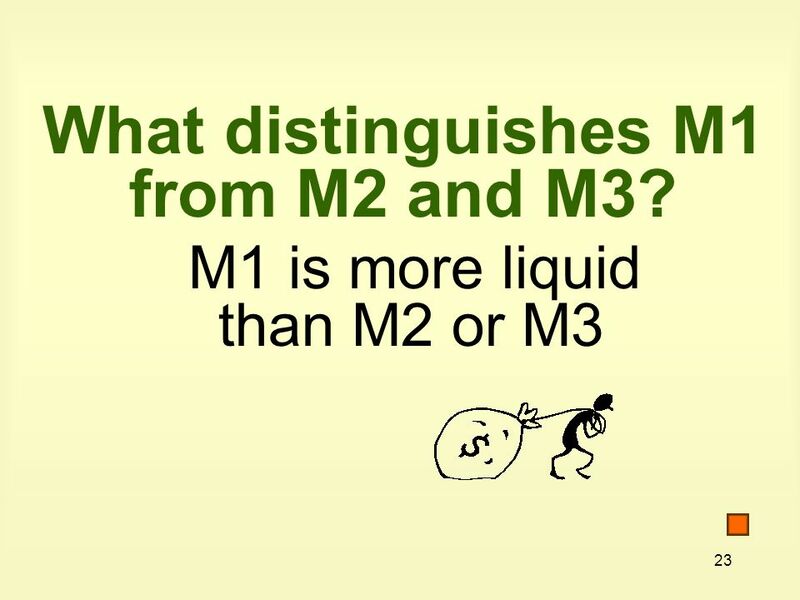 What is M2? 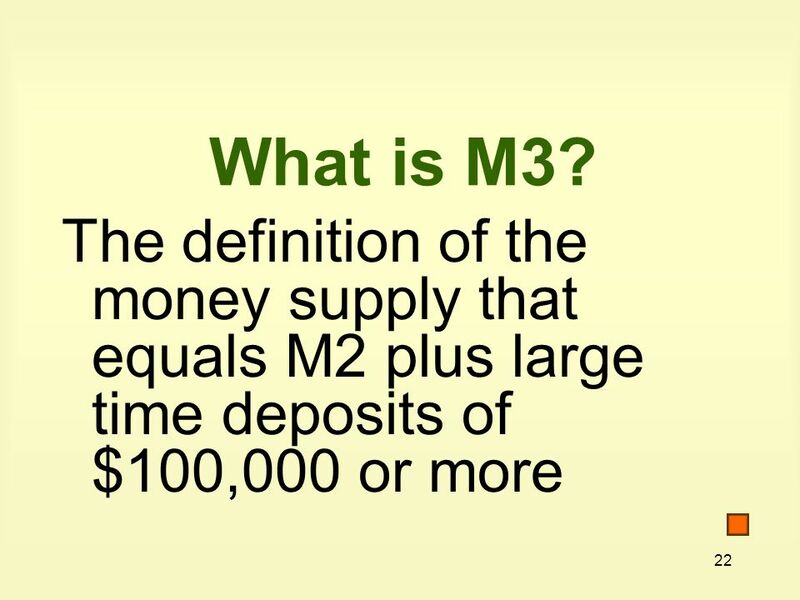 What is M3? 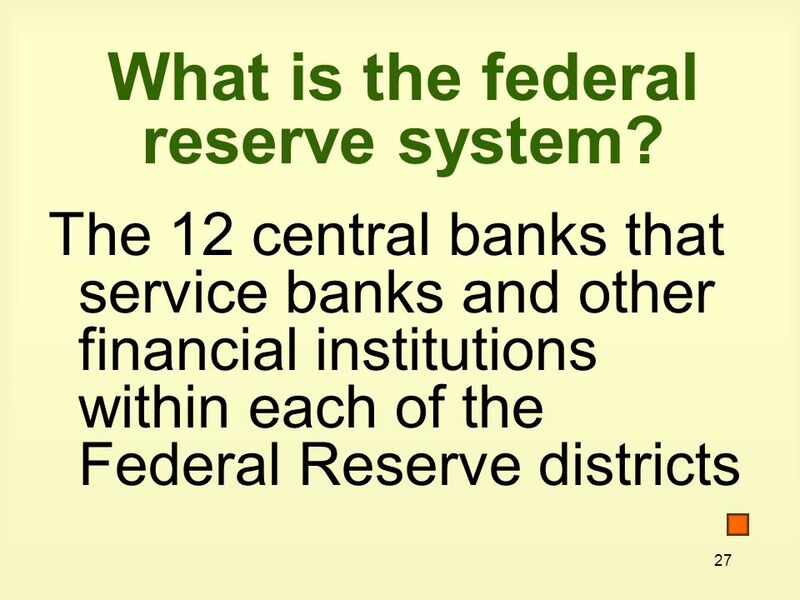 What is the Federal Reserve System? 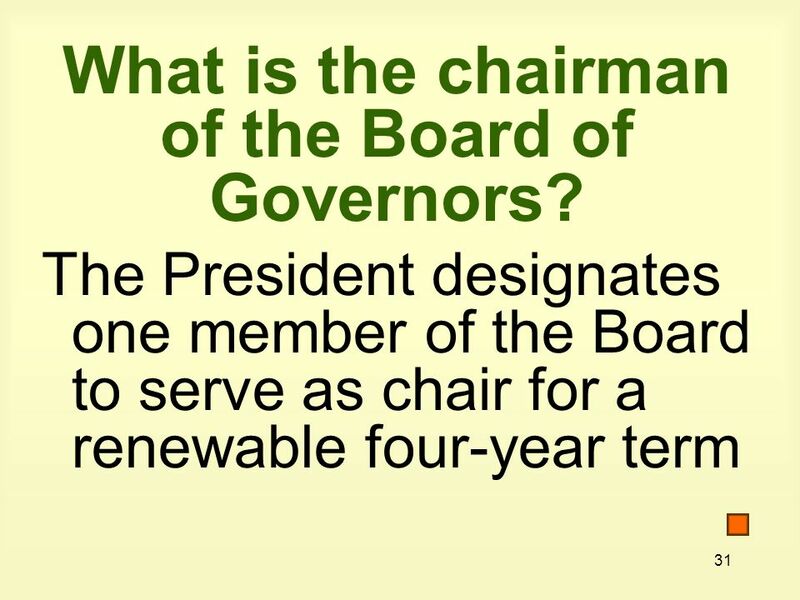 What is the Board of Governors? 44 44 Key Concepts cont. 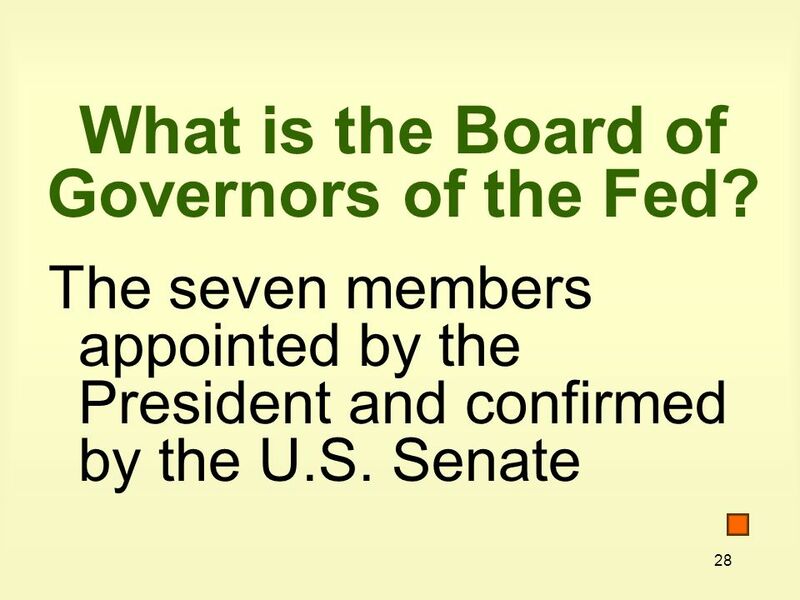 What is the Chairman of the Board of Governors?What is the Chairman of the Board of Governors? 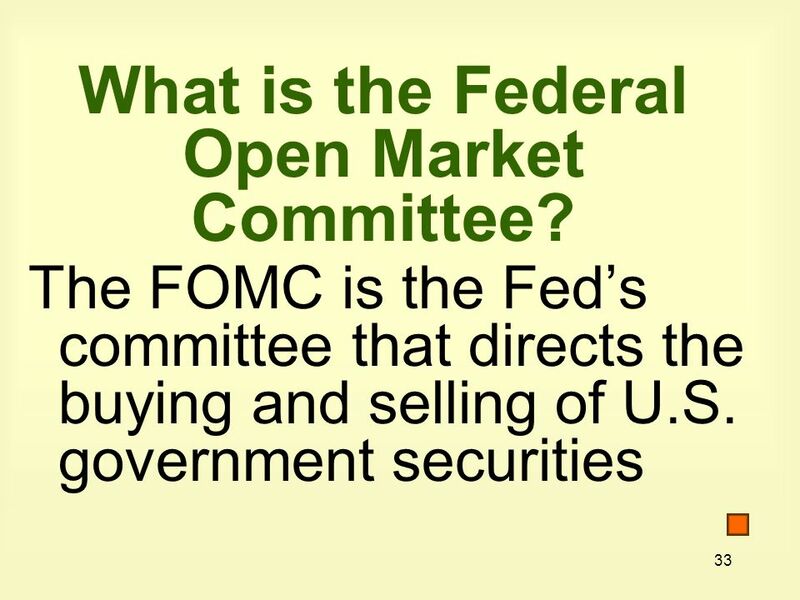 What is the Federal Open Market Committee?What is the Federal Open Market Committee? 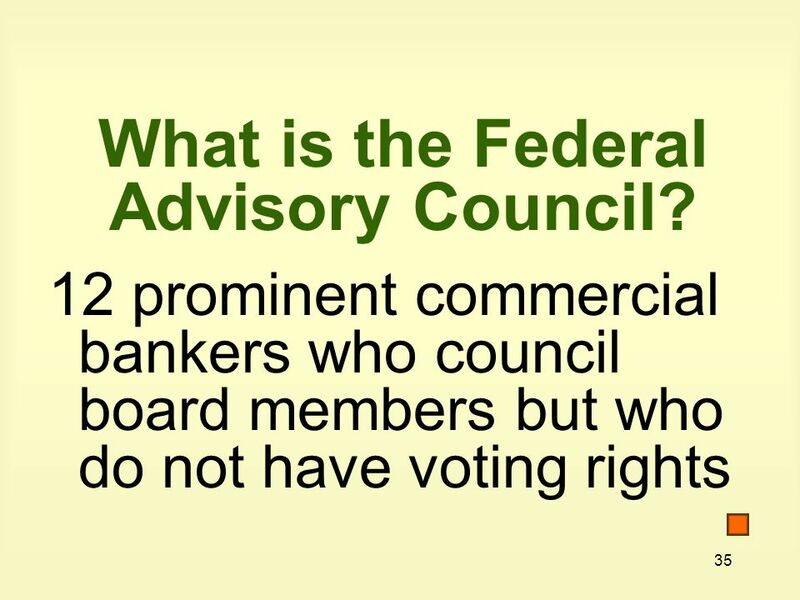 What is the Federal Advisory Council? 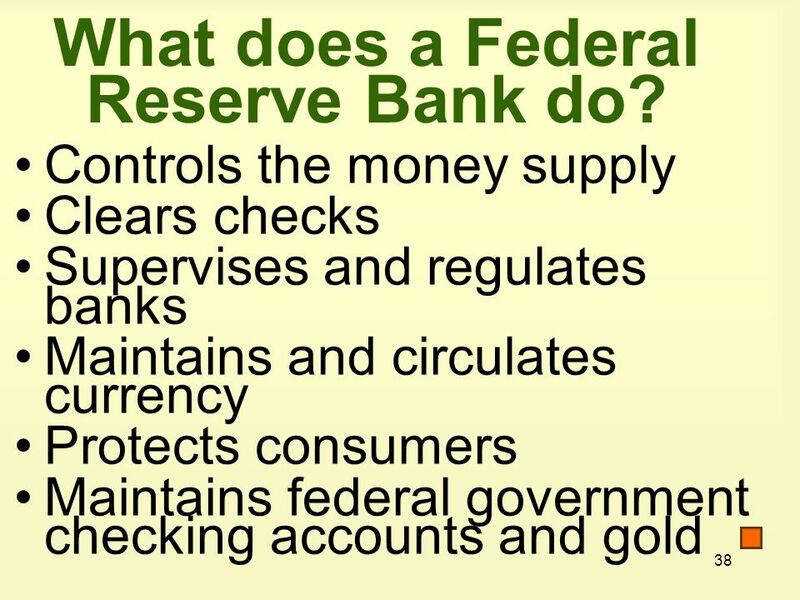 What does a Federal Reserve Bank do? 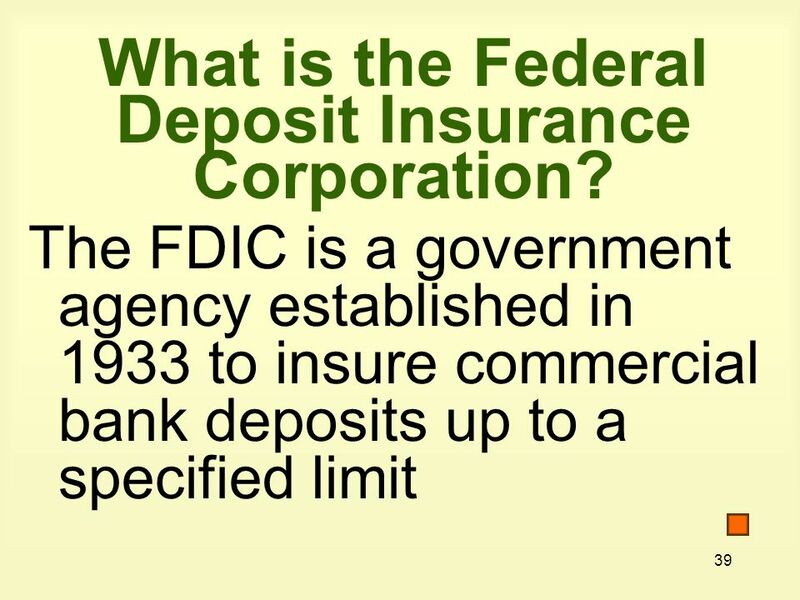 What is the Federal Deposit Insurance Corporation (FDIC)?What is the Federal Deposit Insurance Corporation (FDIC)? 46 46 Money can be anything that meets these three tests. 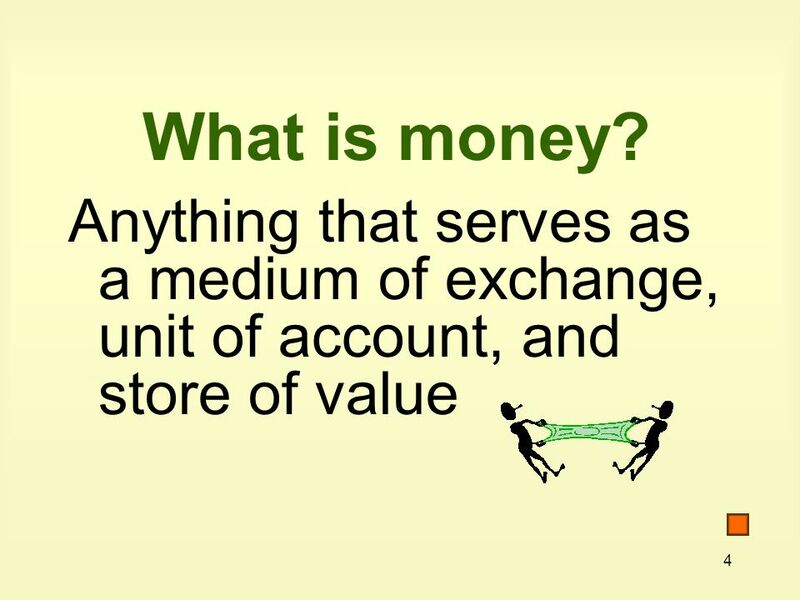 Money must serve as (1) a medium of exchange, (2) a unit of account, and (3) a store of value. 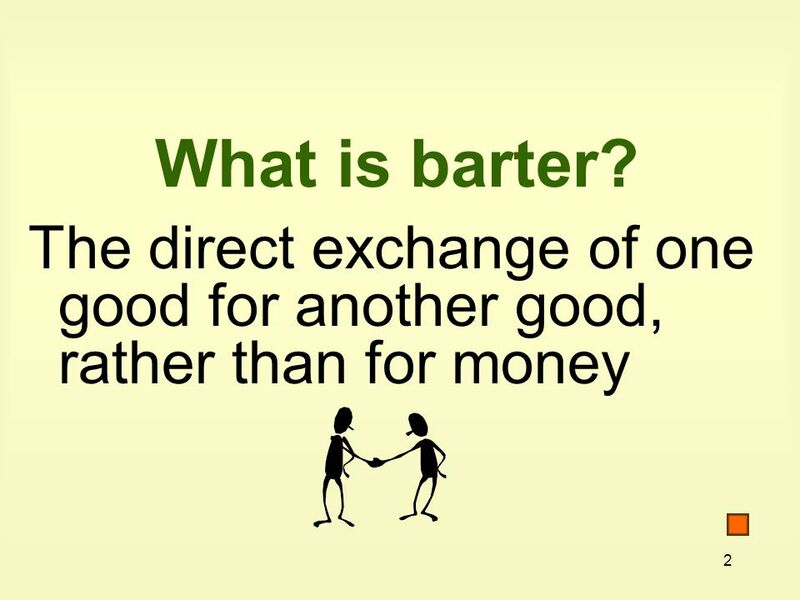 Money facilitates more efficient exchange than barter. 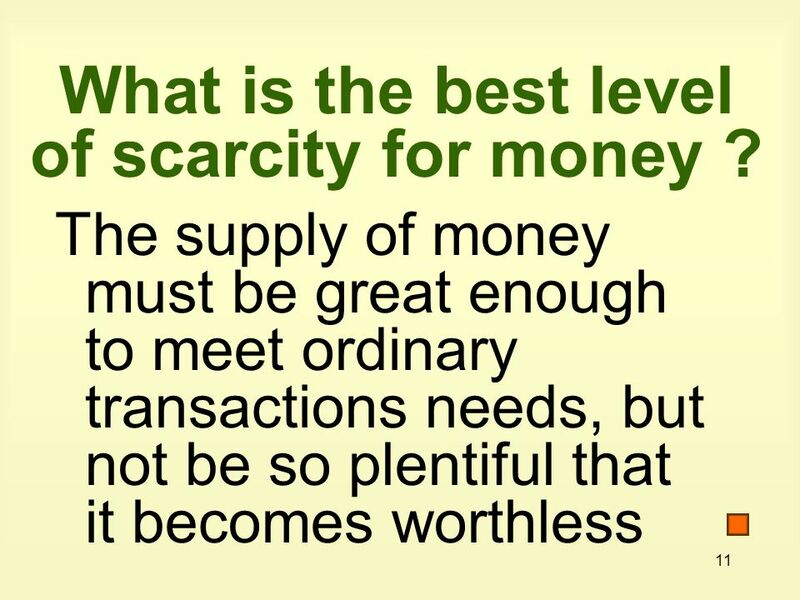 Other desirable properties of money include scarcity, portability, divisibility, and uniformity. 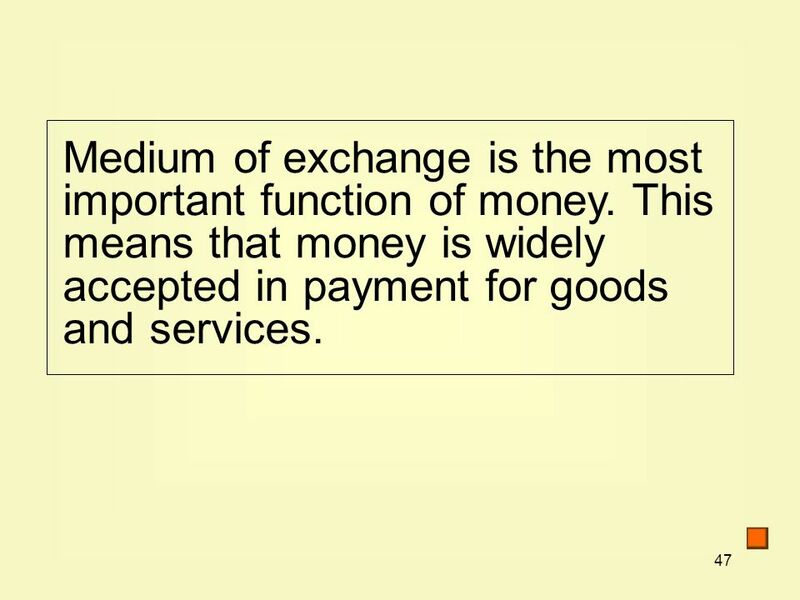 47 47 Medium of exchange is the most important function of money. 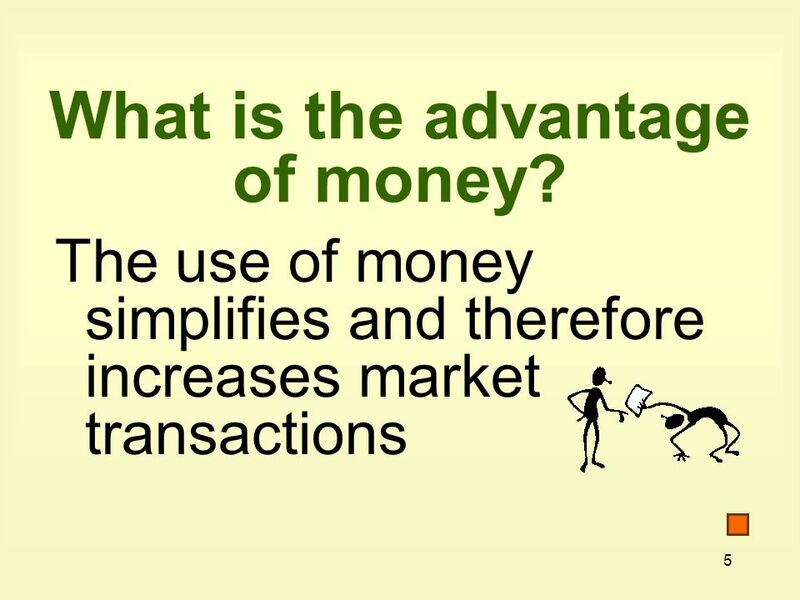 This means that money is widely accepted in payment for goods and services. 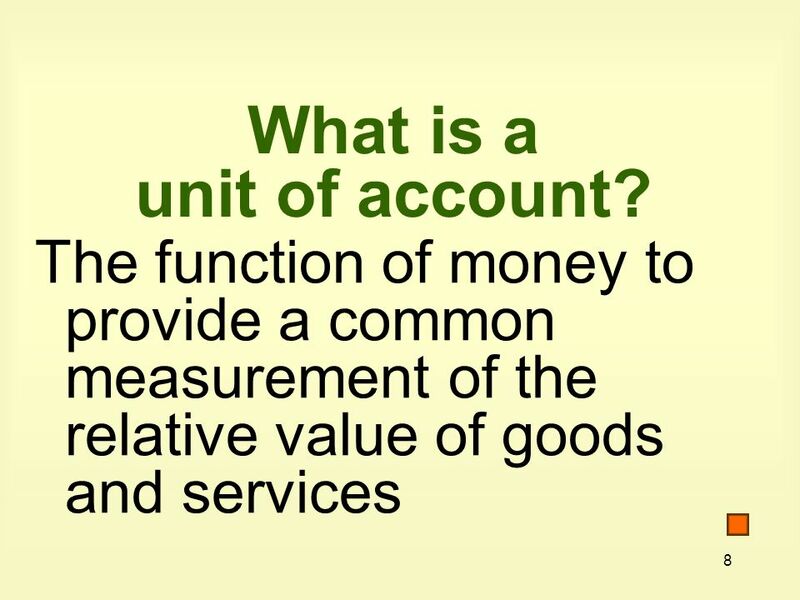 48 48 Unit of account is another important function of money. 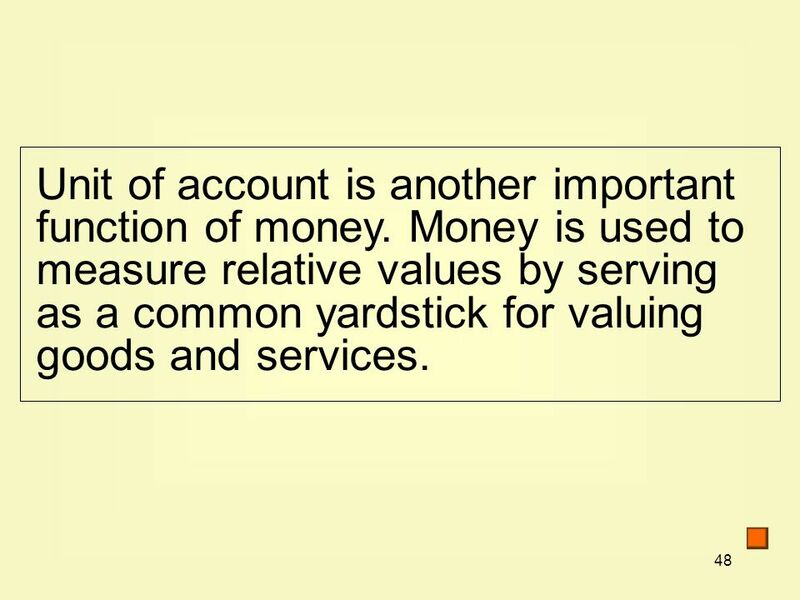 Money is used to measure relative values by serving as a common yardstick for valuing goods and services. 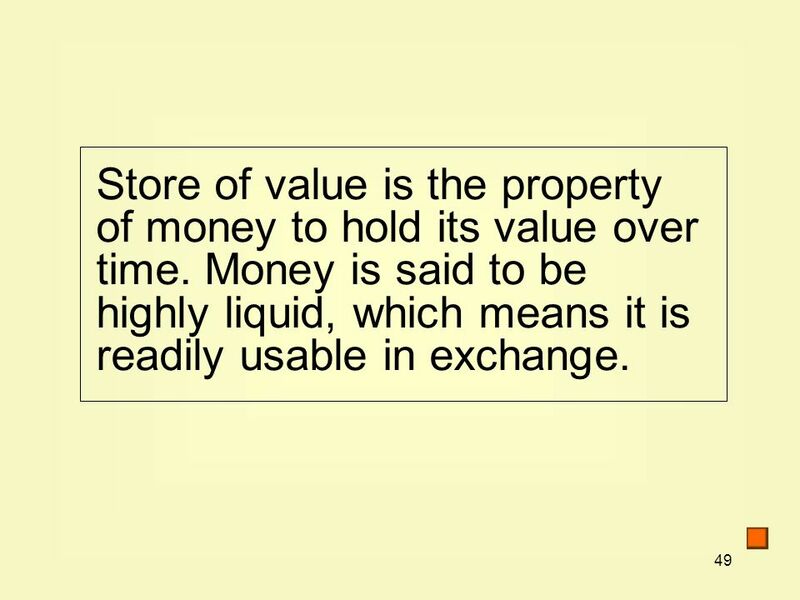 49 49 Store of value is the property of money to hold its value over time. Money is said to be highly liquid, which means it is readily usable in exchange. 50 50 Credit cards are not money. 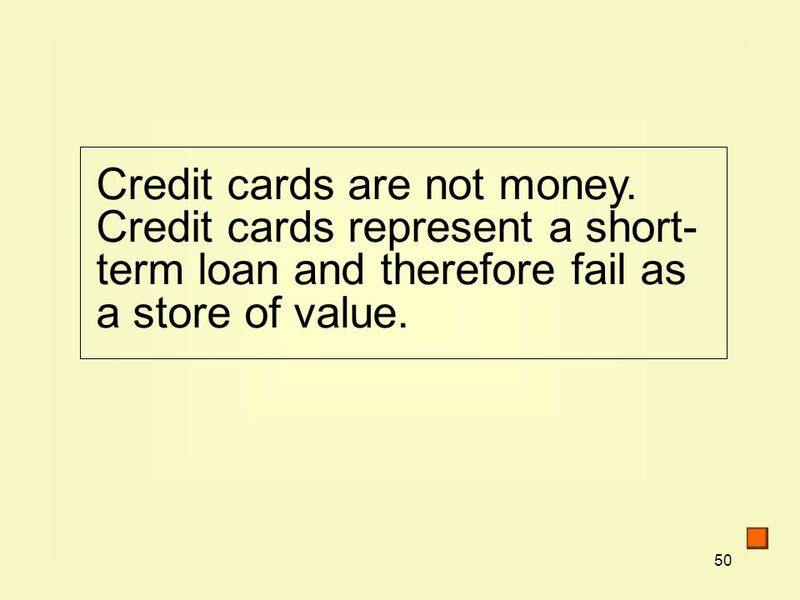 Credit cards represent a short- term loan and therefore fail as a store of value. 51 51 Commodity money is money that has a marketable value, such as gold and silver. 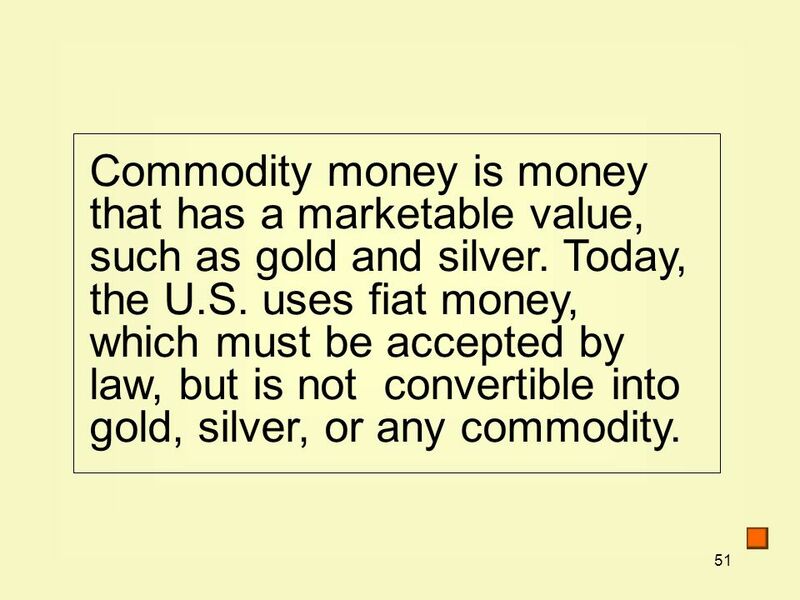 Today, the U.S. uses fiat money, which must be accepted by law, but is not convertible into gold, silver, or any commodity. 52 52 M1 is the narrowest definition of money, which equals currency plus traveler’s checks plus checkable deposits. 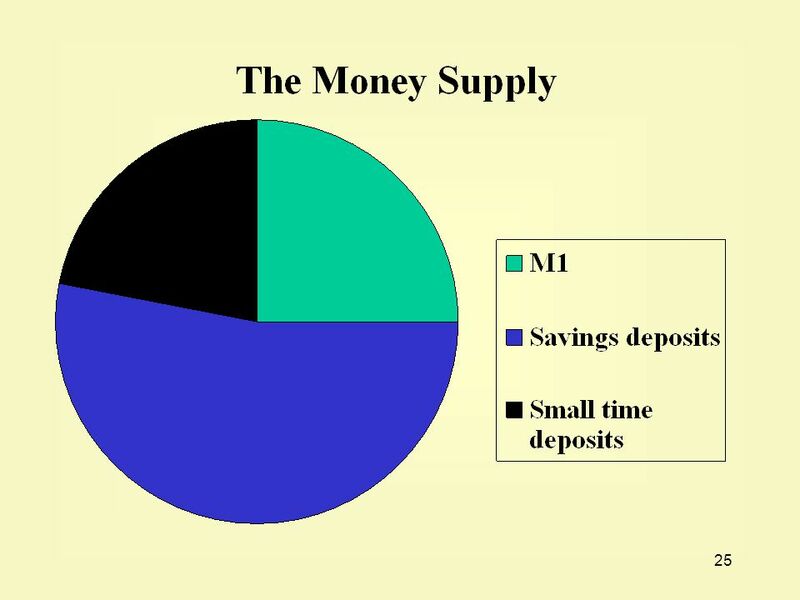 53 53 M2 is a broader definition of money, which equals M1 plus near monies, such as savings deposits and small time deposits. 54 54 M3 is an even broader definition of money, which equals M2 plus large time deposits of more than $100,000 or more. 56 56 1. 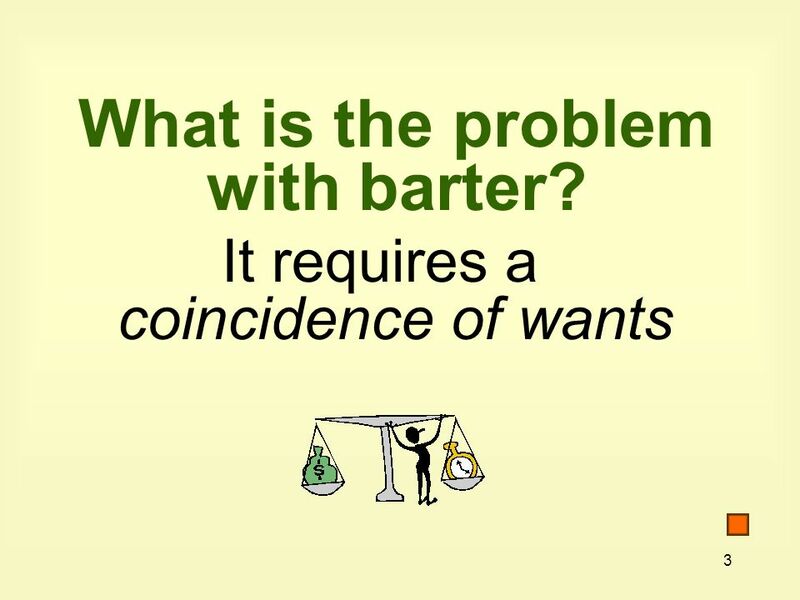 Which of the following is a problem with barter? a. Individuals will not exchange goods. b. Individuals’ wants must coincide in order for there to be exchange. 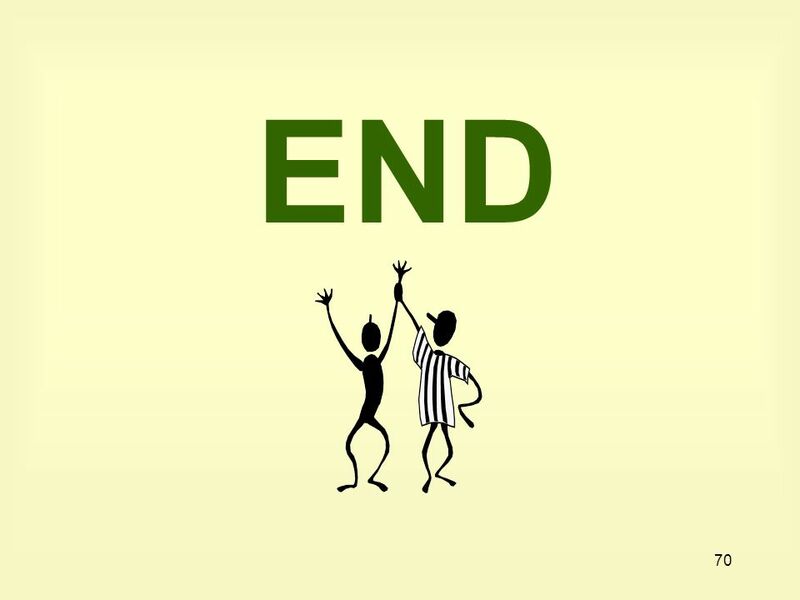 c. Goods can be exchanged, but services cannot. d. None of the above is a problem. B. 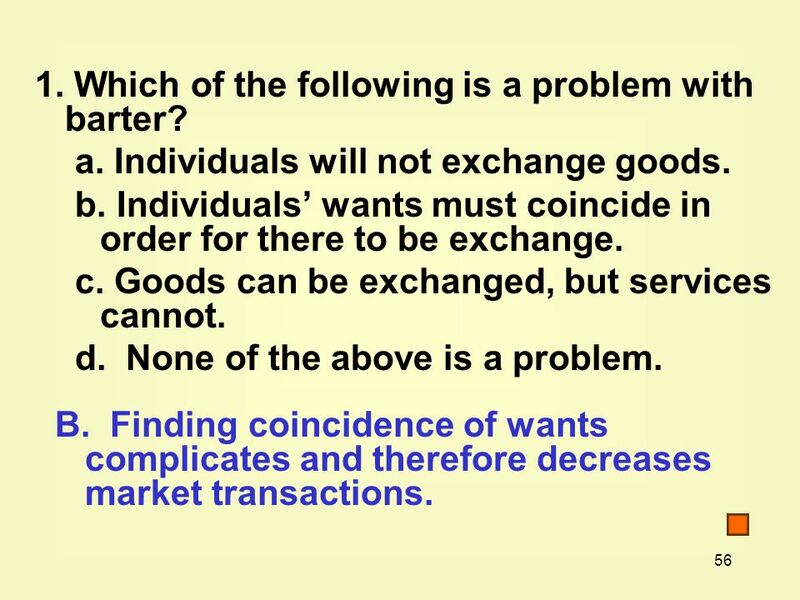 Finding coincidence of wants complicates and therefore decreases market transactions. 57 57 2. 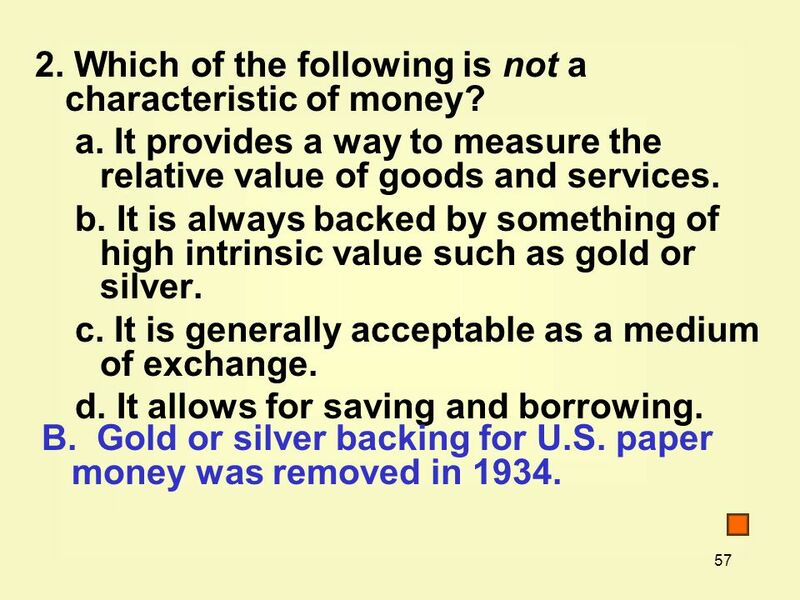 Which of the following is not a characteristic of money? a. It provides a way to measure the relative value of goods and services. b. It is always backed by something of high intrinsic value such as gold or silver. 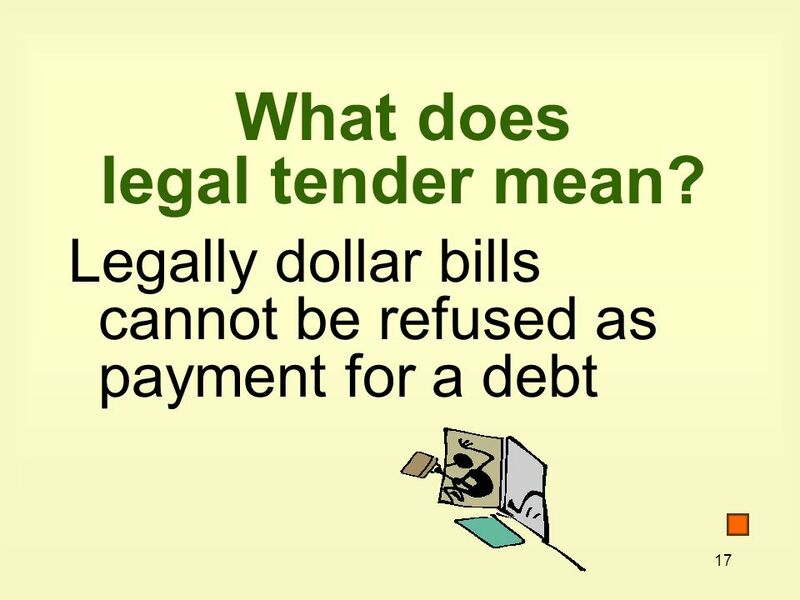 c. It is generally acceptable as a medium of exchange. d. It allows for saving and borrowing. B. 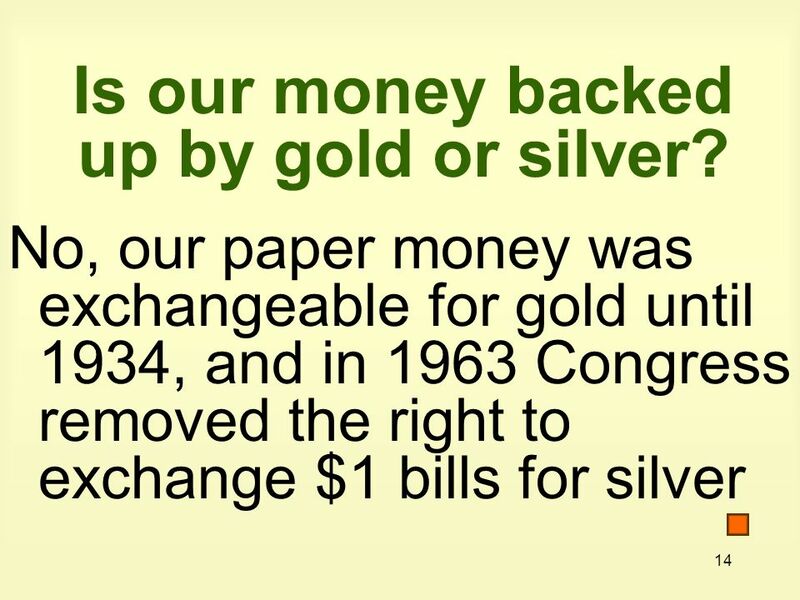 Gold or silver backing for U.S. paper money was removed in 1934. 58 58 3. 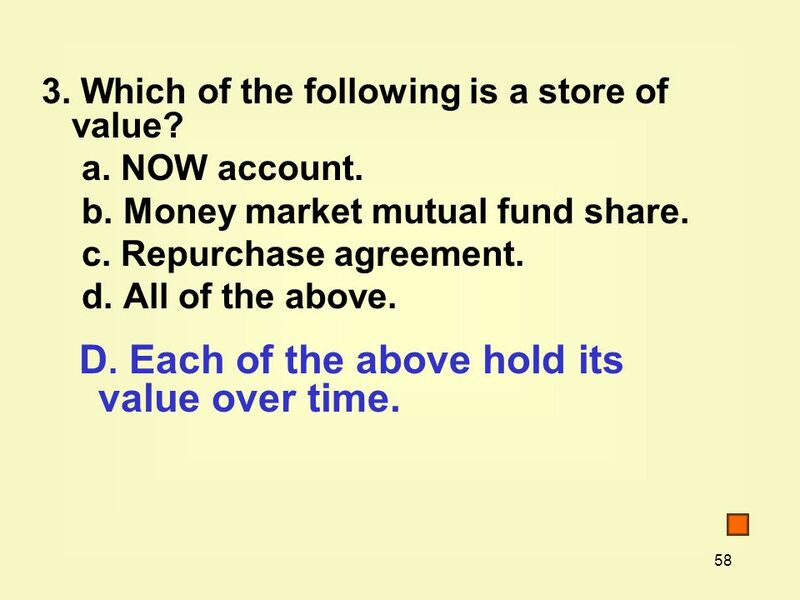 Which of the following is a store of value? a. NOW account. b. Money market mutual fund share. c. Repurchase agreement. d. All of the above. D. Each of the above hold its value over time. 59 59 4. 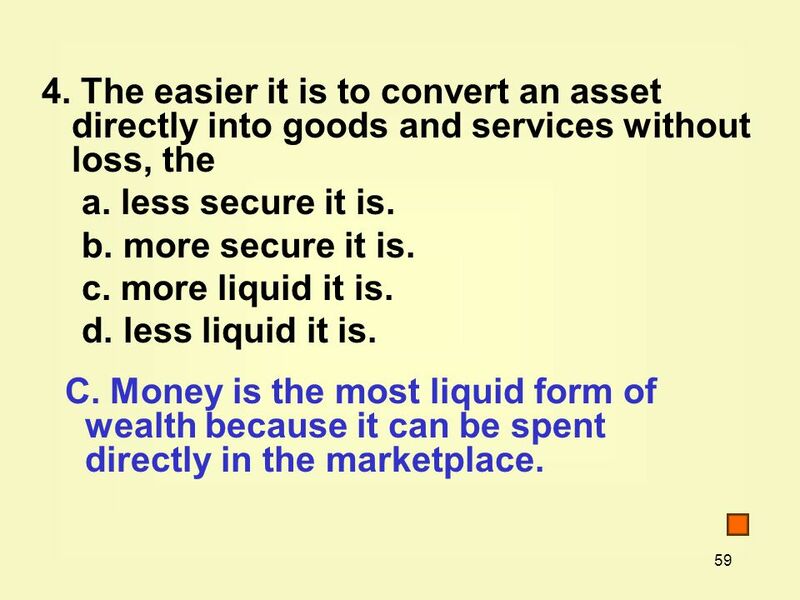 The easier it is to convert an asset directly into goods and services without loss, the a. less secure it is. b. more secure it is. c. more liquid it is. d. less liquid it is. C. Money is the most liquid form of wealth because it can be spent directly in the marketplace. 60 60 5. 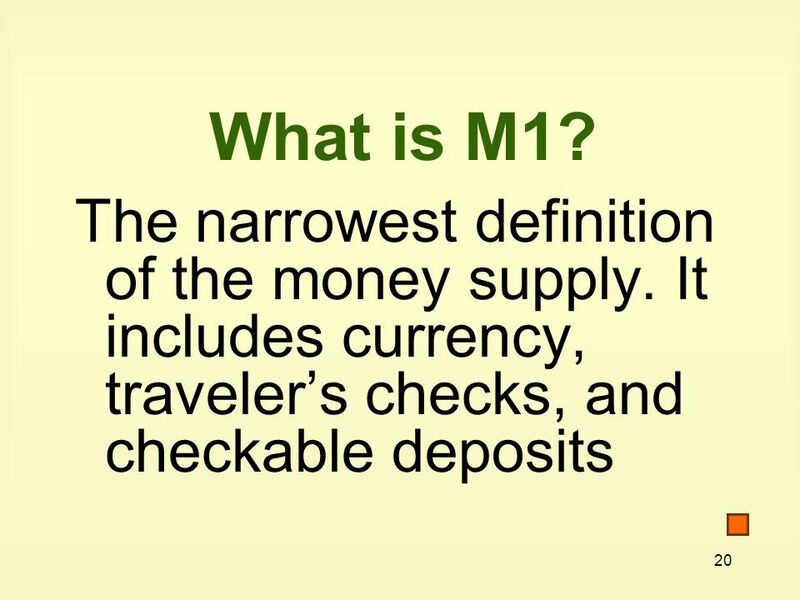 M1 refers to a. the money supply. b. currency held by the public plus checking account balances. c. the smallest of the money-supply definitions. d. all of the above. 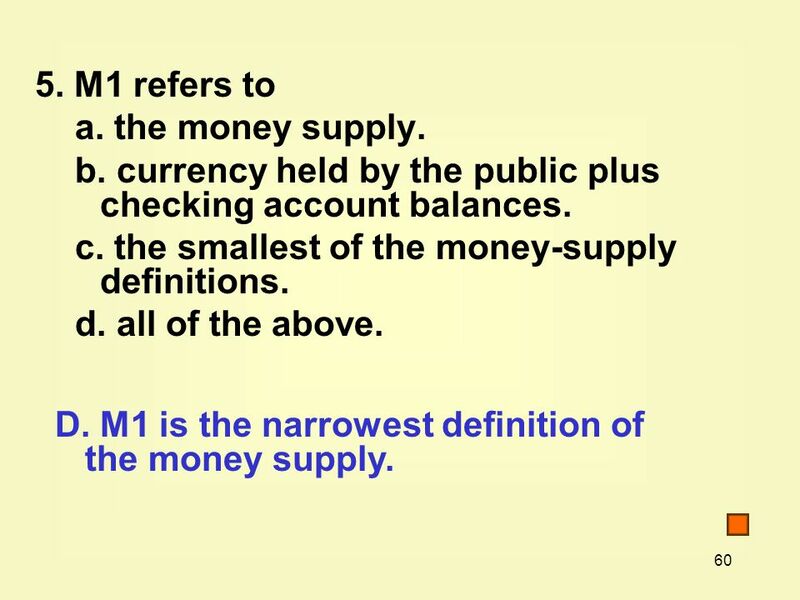 D. M1 is the narrowest definition of the money supply. 61 61 6. 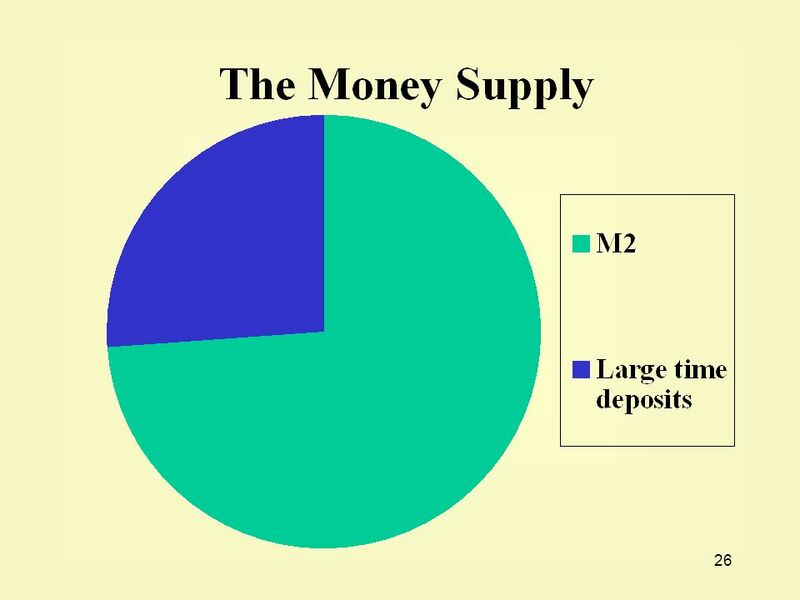 The M1 definition of the money supply includes a. coins and currency in circulation. b. coins and currency in circulation, checkable deposits, and traveler’s checks. 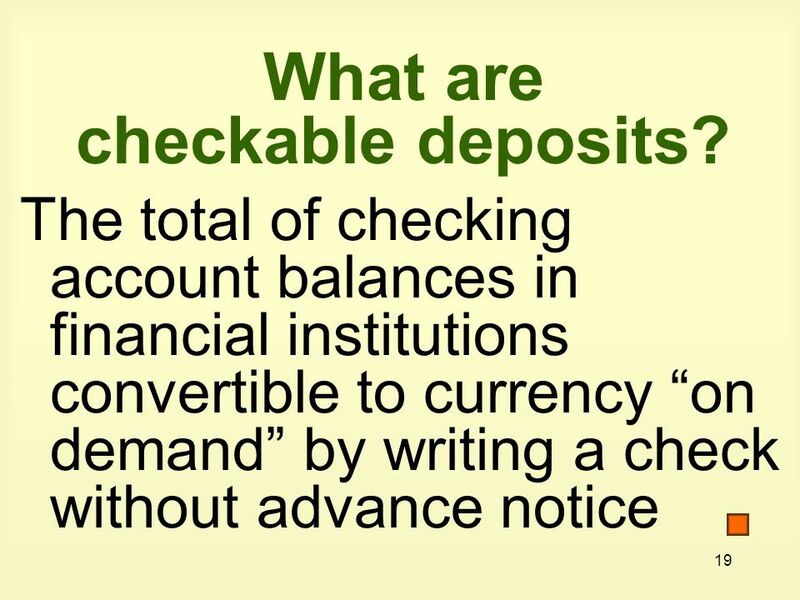 c. Federal Reserve notes, gold certificates, and checkable deposits. 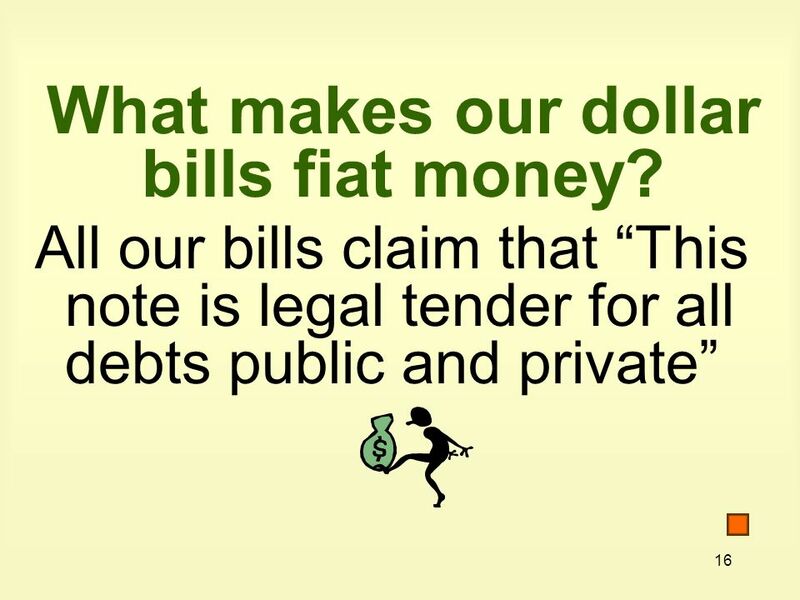 d. Federal Reserve notes and bank loans. B. 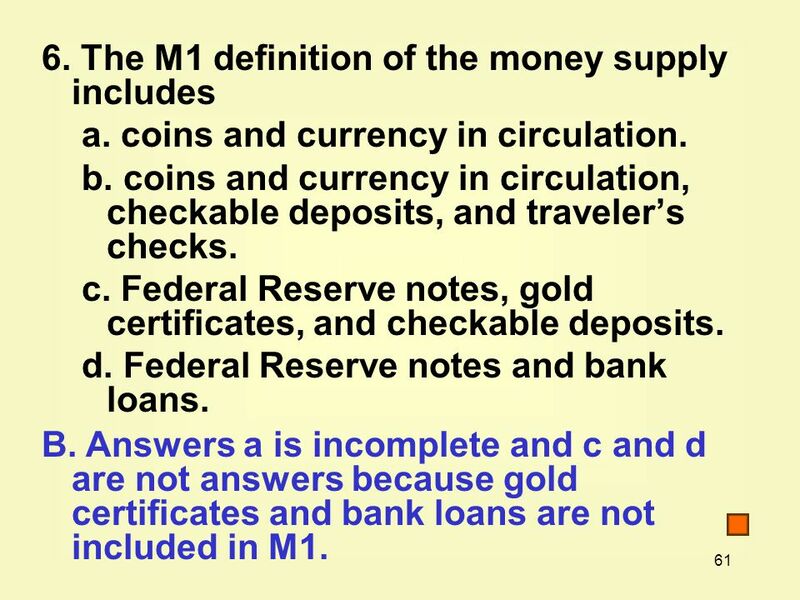 Answers a is incomplete and c and d are not answers because gold certificates and bank loans are not included in M1. 62 62 7. 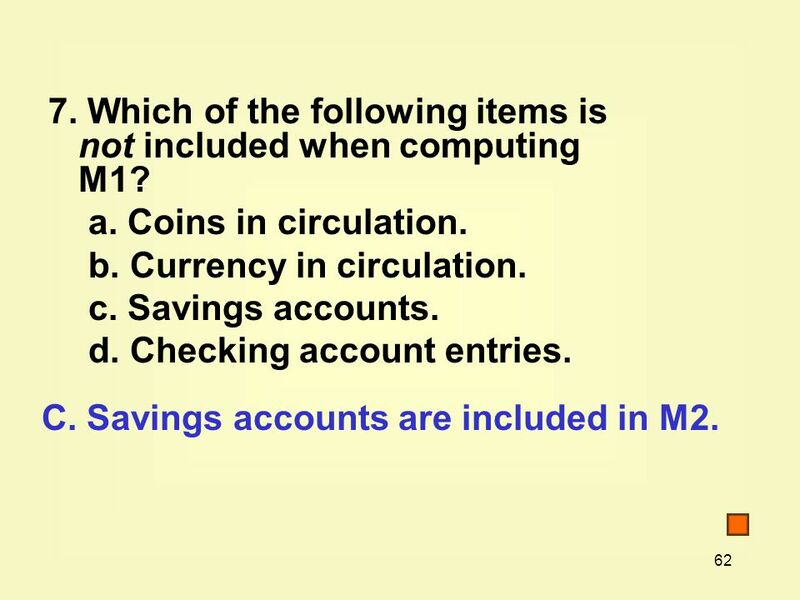 Which of the following items is not included when computing M1? a. Coins in circulation. b. Currency in circulation. c. Savings accounts. d. Checking account entries. 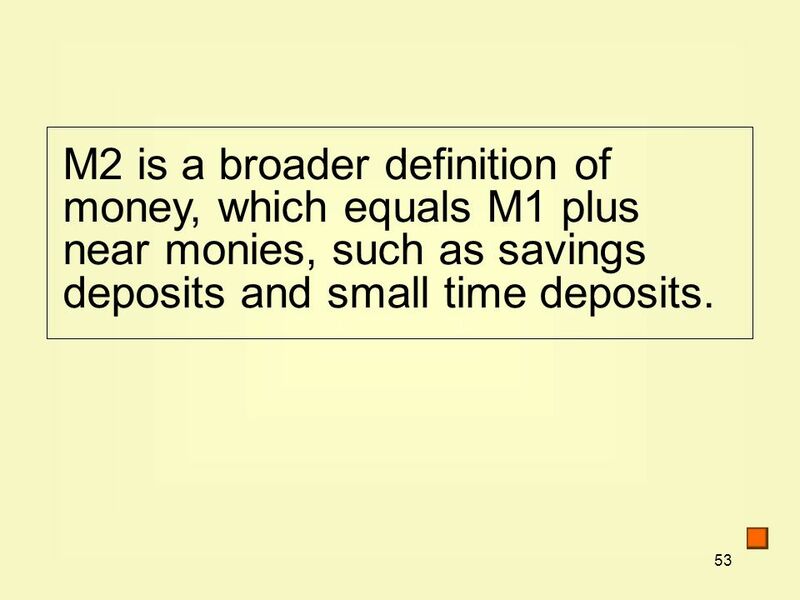 C. Savings accounts are included in M2. 63 63 8. 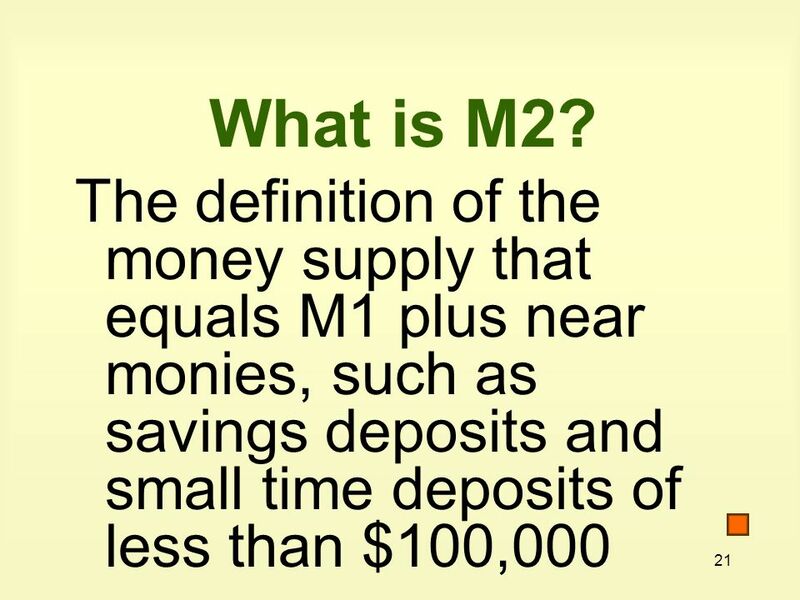 Which one of the following is part of the M2 definition of the money supply, but not part of M1? 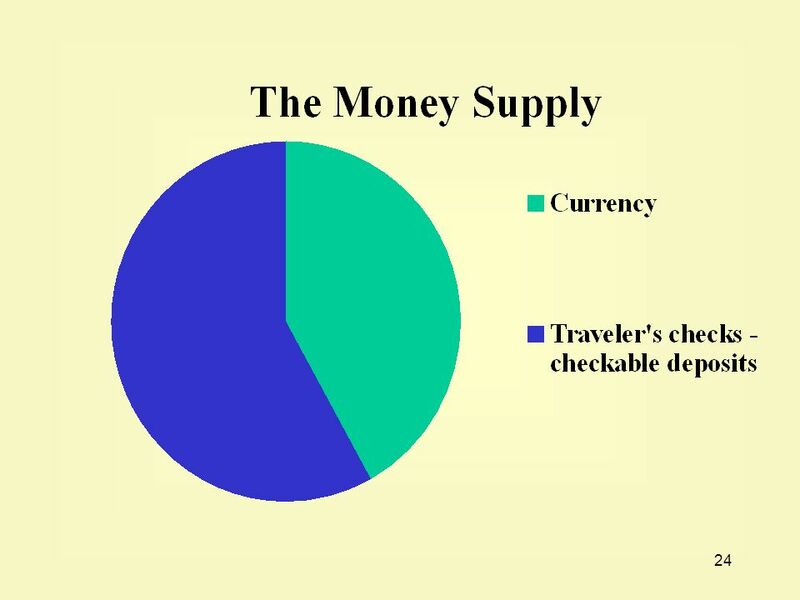 a. Traveler’s checks. b. Currency held in banks. c. Currency in circulation. d. Money market mutual shares. 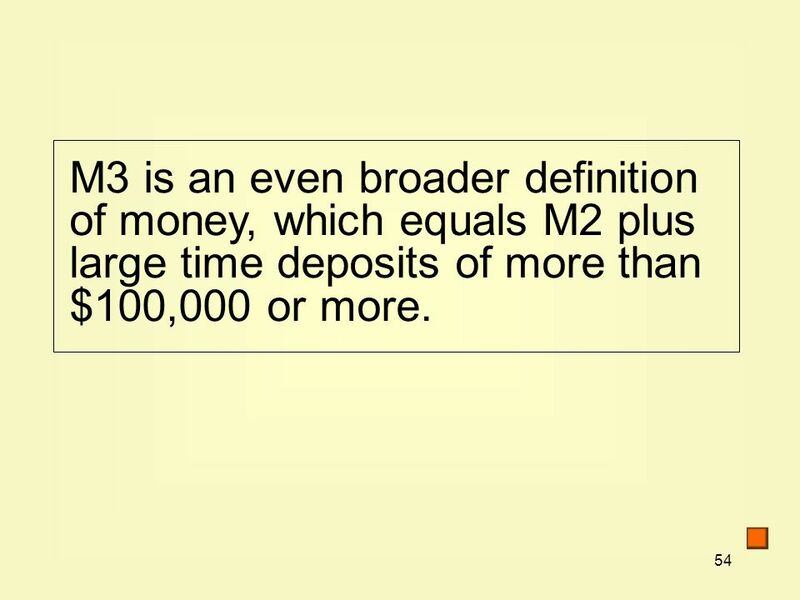 D. Note that M1 is part of M2. 64 64 9. 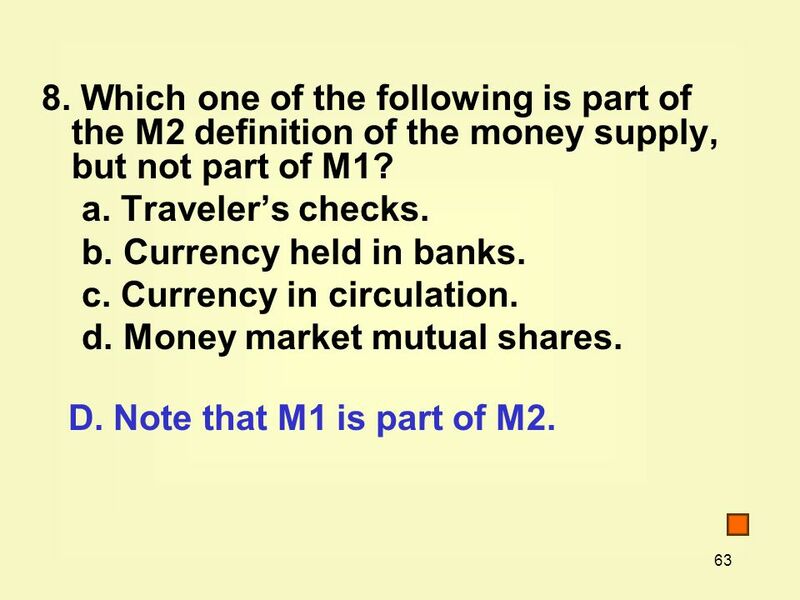 Which of the following is not part of M1? a. Checking accounts. b. Coins. c. Credit cards. 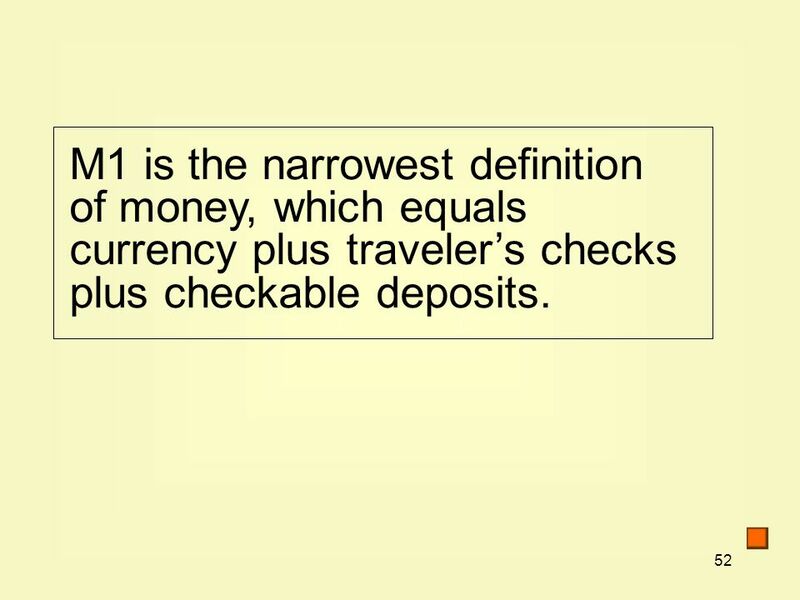 d. Traveler’s checks e. Paper currency. C. Credit cards are not considered money. They fail to meet the store of value characteristic. 65 65 10. 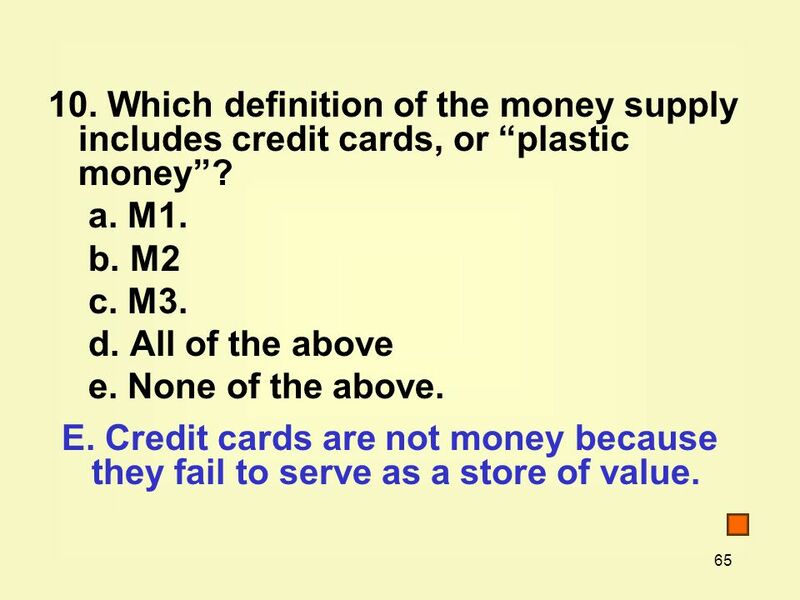 Which definition of the money supply includes credit cards, or “plastic money”? a. M1. b. M2 c. M3. d. All of the above e. None of the above. 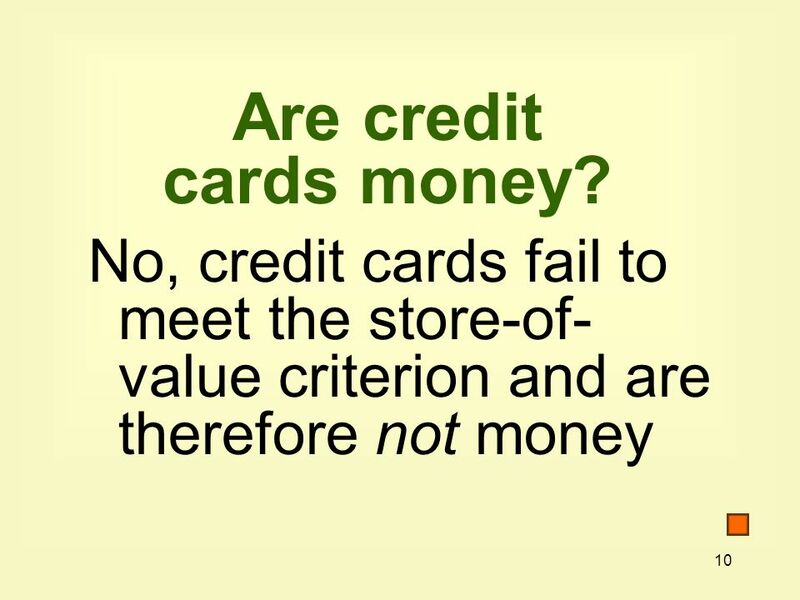 E. Credit cards are not money because they fail to serve as a store of value. 66 66 11. Which of the following institutions has the responsibility to control the money supply? a. Commercial banks. b. Congress. c. The U.S. Treasury Department. 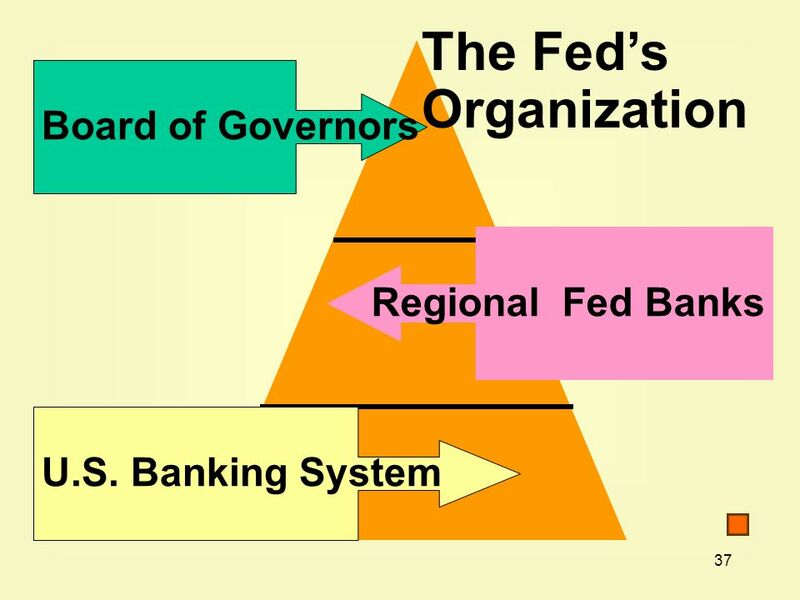 d. The Federal Reserve System. D. The Federal Reserve System is our central bank. 67 67 12. 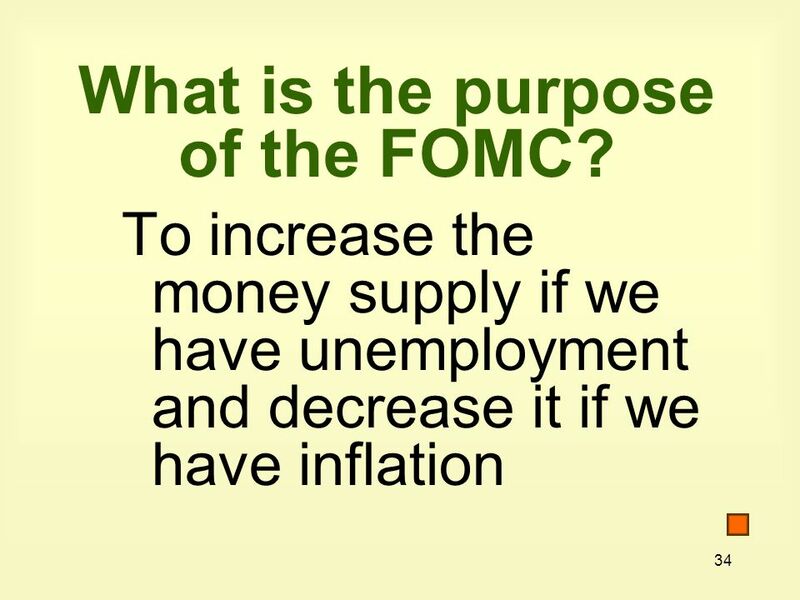 Which of the following is not one of the function of the Federal Reserve? a. Clearing checks. b. Printing currency. c. Supervising and regulating banks. d. Controlling the money supply. B. The U.S. Treasury prints our currency. 68 68 13. 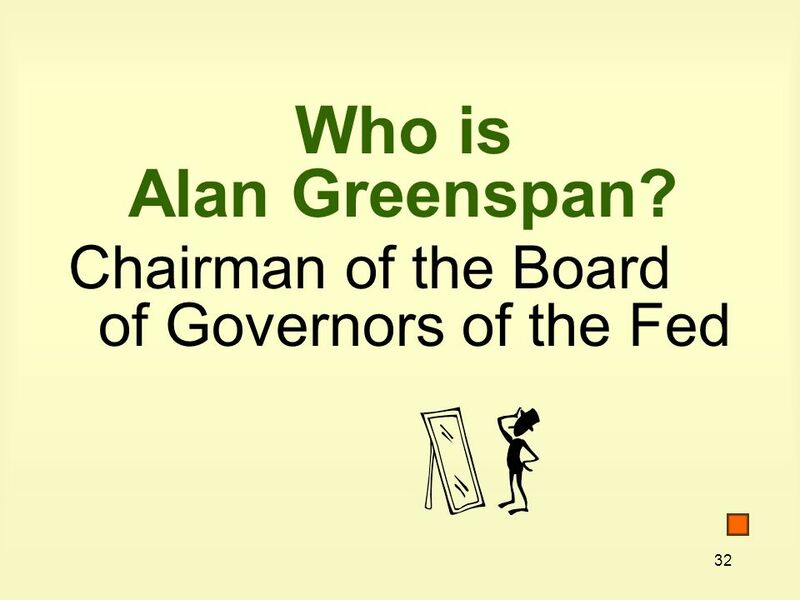 Which of the following is in charge of the buying and selling of government securities by the Fed? a. The president. b. The Federal Open Market Committee. c. The Congress. d. None of the above. B. Selling U.S. securities (Treasury bills, notes, and bonds) is one of the major tools for controlling the money supply. 69 69 14. The major protection against sudden mass attempts to withdraw cash from banks is the a. Federal Reserve. b. Consumer Protection Act. c. deposit insurance provided by the FDIC. d. gold and silver backing the dollar. 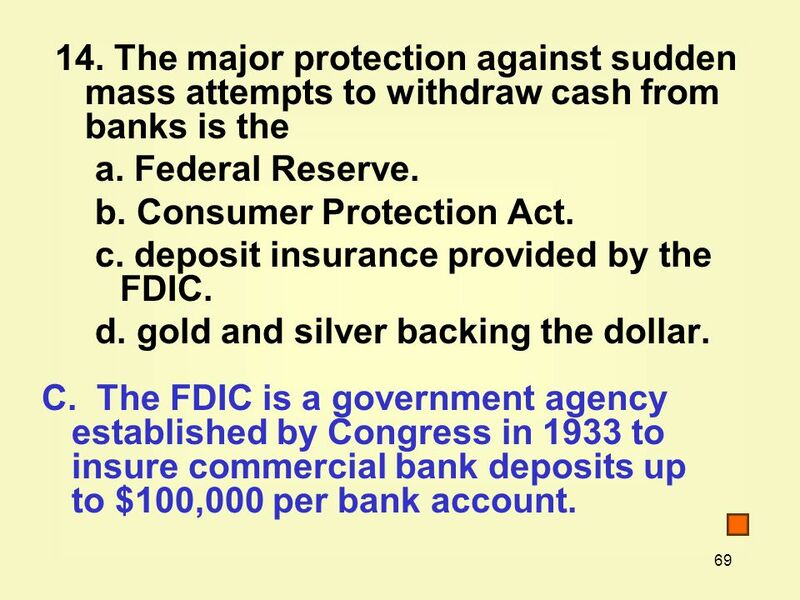 C. The FDIC is a government agency established by Congress in 1933 to insure commercial bank deposits up to $100,000 per bank account. 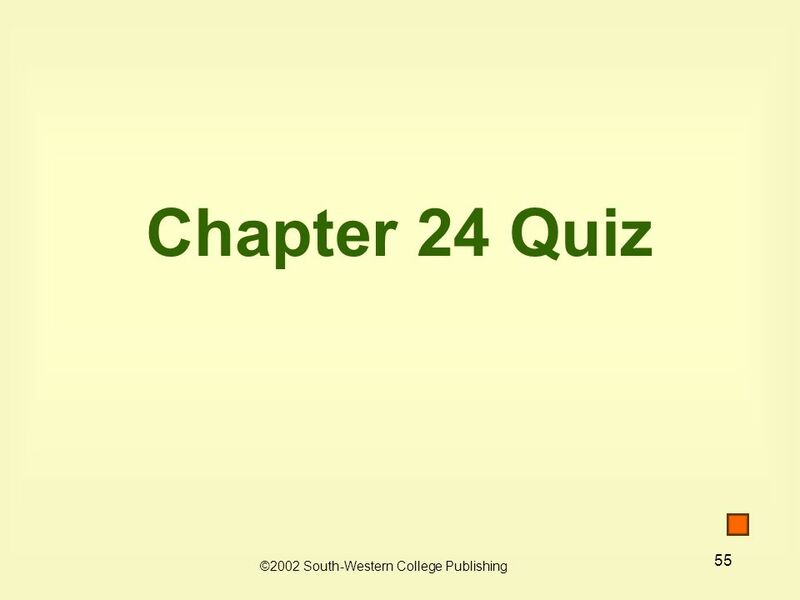 Download ppt "1 Chapter 24 Money and the Federal Reserve System Key Concepts Key Concepts Summary Summary Practice Quiz Internet Exercises Internet Exercises ©2002 South-Western." What is Money Ch 13. MONEY AND PRICES IN THE LONG RUN. Copyright © 2004 South-Western 16 The Monetary System. 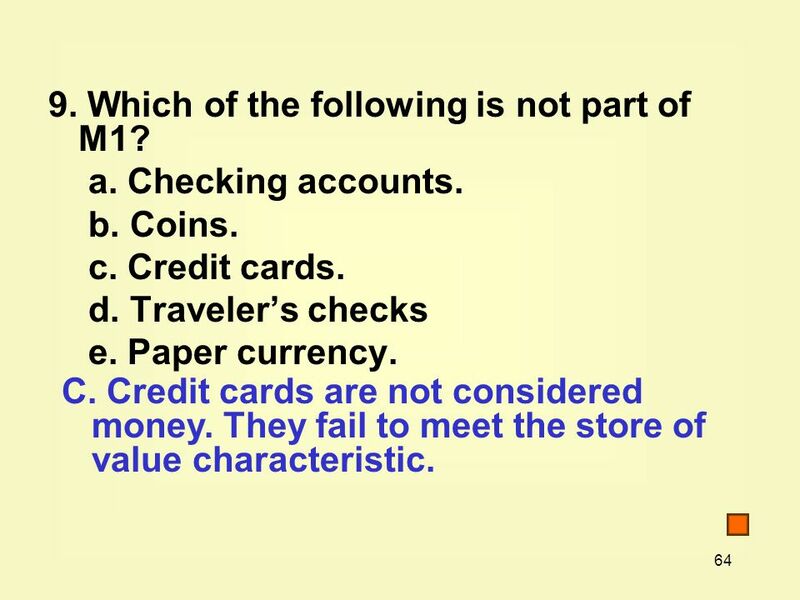 1 Chapter 18 Practice Quiz Tutorial Money and The Federal Reserve ©2004 South-Western. Chapter 3: What is Money? ALOMAR_212_2. 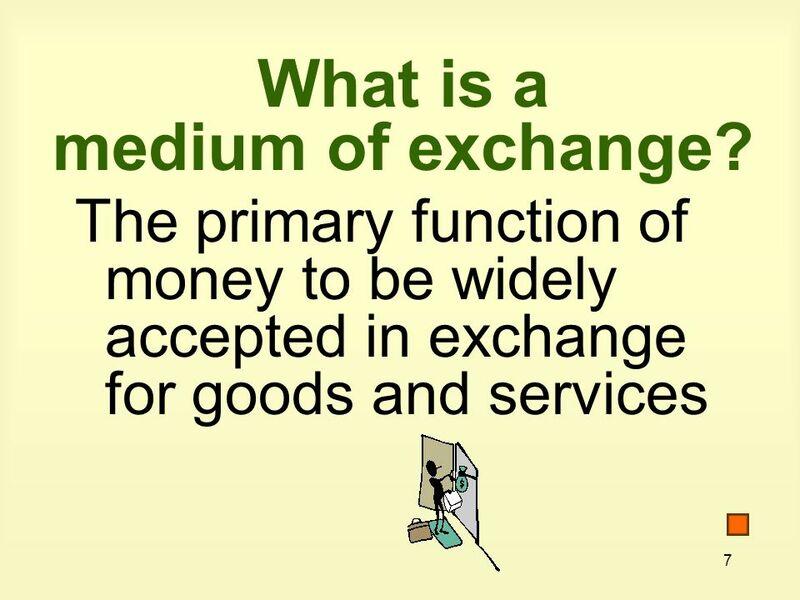 Medium of exchange: Money can be exchanged for goods and services. Money and Banking Chapter 14 McGraw-Hill/Irwin Copyright © 2009 by The McGraw-Hill Companies, Inc. All rights reserved. 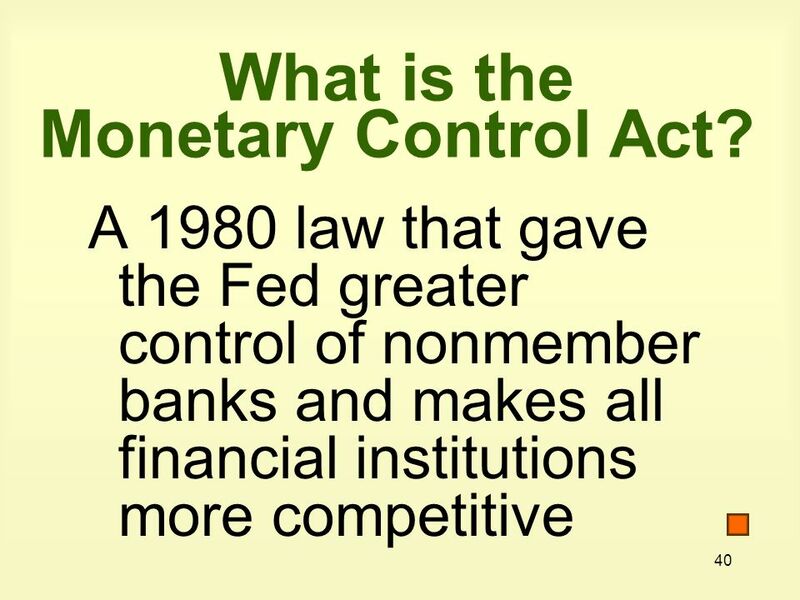 PART SIX Money, Banking, and Monetary Policy. Chapter 15: Money and Banking Copyright © 2005 by The McGraw-Hill Companies, Inc. All rights reserved. 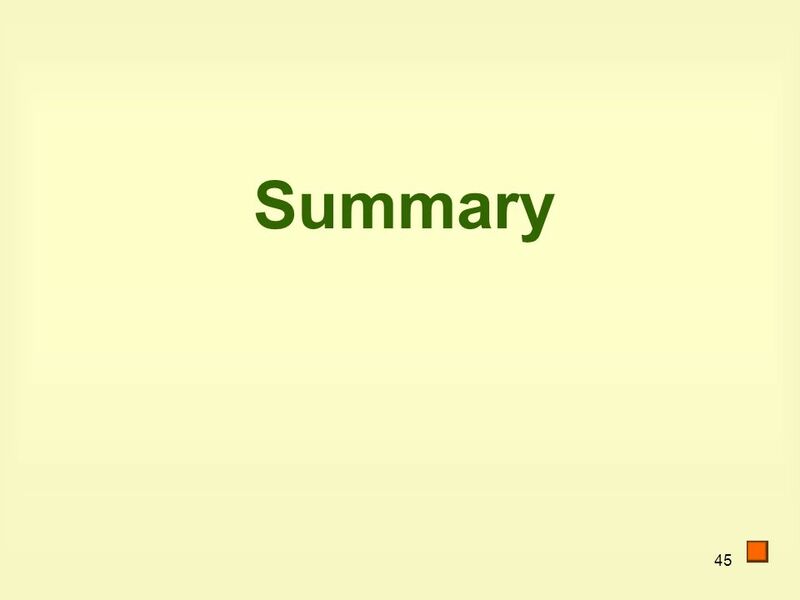 Macroeconomics - ECO 2013 Fall 205 – 1 Term August 24 – December 16, 2005. Money and Banking Chapter 10. CHAPTER 10.1 MONEY Three uses of $ 6 Characteristics of $ Source of $’s value MONEY Three uses of $ 6 Characteristics of $ Source of $’s value. 1 Chapter 5 Money and the Federal Reserve These slides supplement the textbook, but should not replace reading the textbook. 1 Money and the Banking System. 2 Do you know anyone with a lot of money? What does that mean? Some people make a great income each year. So they probably. 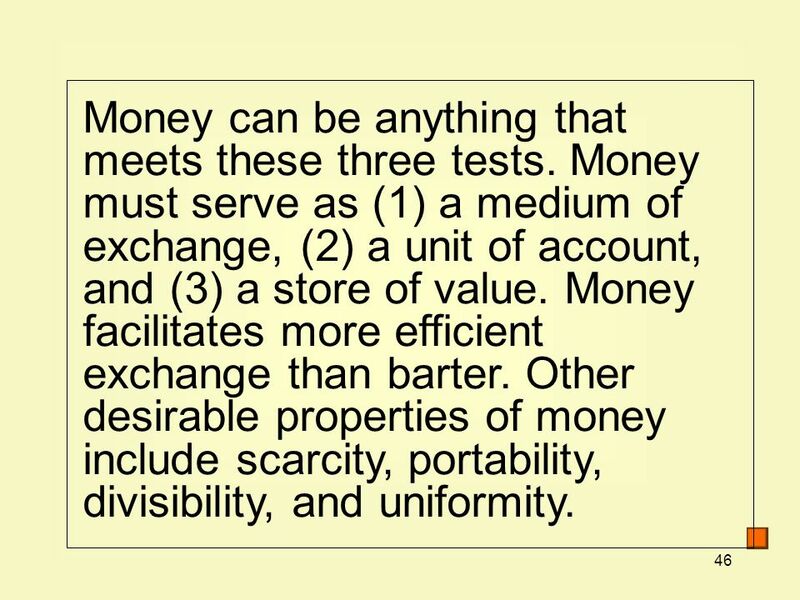 The Monetary System Chapter 27 Copyright © 2001 by Harcourt, Inc. All rights reserved. Requests for permission to make copies of any part of the work should. “Money is whatever is generally accepted in exchange for goods and services — a temporary abode of purchasing power to be used for buying still other goods. 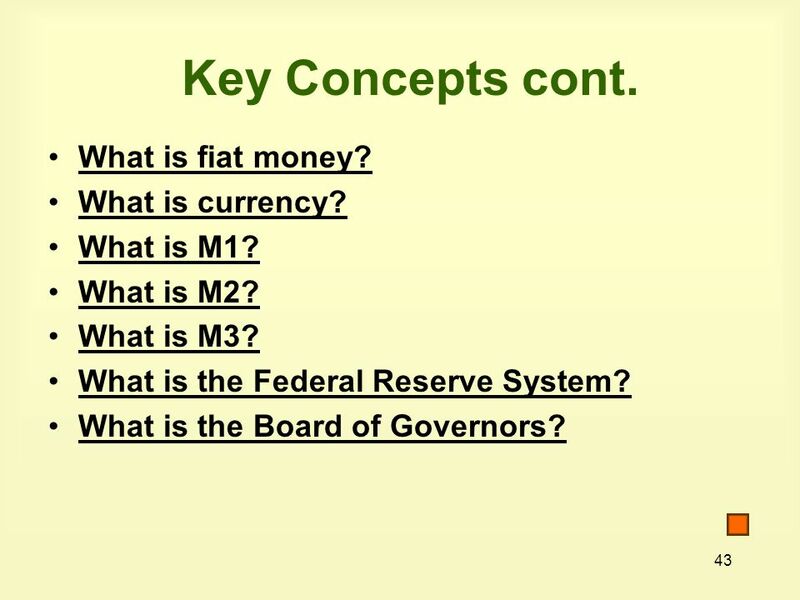 Money and the Monetary System Outline The definition and functions of money Measuring the money supply Financial institutions The Federal Reserve system. Harcourt Brace & Company Chapter 15 The Monetary System.